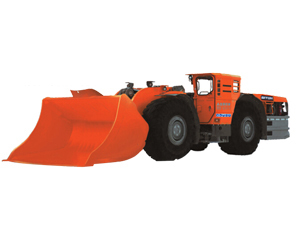 This diesel-powered LHD loaders can be used to shovel, load and transport the loosen materials in mine and well.The underground diesel LHD (Load Haul Dumper) loader can also be applied to the tunnel engineering in railway, highway, and water conservation project, etc. It is especially suitable for working under the wicked condition, such as narrow, low-rise and muddy working places. 1. The hydraulic drive system and engine of this diesel LHD (Load Haul Dumper) underground wheel loader are all from DANA, which can give full play to the motor efficiency. Furthermore, this system can adapt the change of loading capacity and the change of the speed automatically. 2. This machine adopts power shift gearbox, which ensure the easy and flexible operation. 3. This diesel LHD loader machine is driven by front and rear axle. The front axle is equipped with antiskid differential. It features large climbing capacity and large driving force. It is designed for various wicked roads. 4. The tyre of diesel LHD (Load Haul Dumper) underground wheel loader has the traits of smooth face and cutting bearing, so the service life is long. 5. This diesel driven loader machine is equipped with articulated frame. The turn radius is small. So the machine is flexibility. 6. The fully-hydraulic steering gear is employed, which features compact structure, stable transformation and convenience maintenance. 7. The fully-hydraulic brake with multi-discs is wet-type. In addition, the dual-circuit brake system is equipped on this underground mining loader machine, which has the traits of simple structure, stable brake, maintenance avoidance, etc. 8. The adoption of double-pump confluence technology is benefit for reducing the energy consumption of hydraulic system. 9. 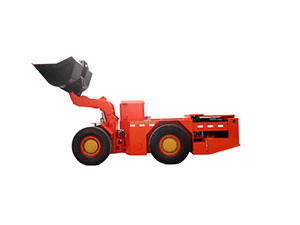 The off-gas of this diesel LHD (Load Haul Dumper) loader machine is treated though the process of oxidation and catalysis. This can reduce greatly the pollution of the off-gas. 10. The hand-operated valve can control the steering of these diesel-powered LHD loaders. The pilot valve can control the lifting and tip-over of the working arm. 11. Finally, this machine has a pleasing appearance after well design and manufacture.